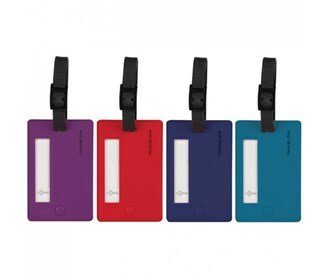 The Travelon Set of 4 Assorted Color Luggage Tags helps you to identify your bag while only revealing your name. This colored tag features a removable strap and swivel to reveal address. The Travelon Set of 4 Assorted Color Luggage Tags - Bolds has many exciting features for users of all types. The Travelon Set of 4 Assorted Color Luggage Tags - Bolds is sold as a Brand New Unopened Item.